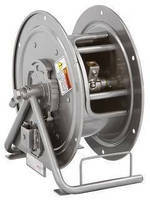 The SGCR Series of spring rewind grounding reels from Hannay Reels is designed to help meet OSHA requirements for vehicle grounding. This reel features a fast, convenient, automatic spring rewind with a ratchet mechanism to lock the reel. It comes with a built-in cable hoop with an internal rotary device. It has been independently rested to 43 kVA for 30 cycles.